You all know that when it comes to eating out I am a committed salad-dodger - the sort of conscious carnivore who will only orders vegetables at dinner if it is Heston Blumenthals' meat fruit. It's not that I'm opposed to eating greens - in fact I love salads in summer - it's just that vegetables don't 'fill me up' or feel as satisfactory the way meat does. And if I'm treating myself to a meal I'd rather get my money's worth and load up on the heavies which to me means slabs of meat. I know that my logic is flawed because my boyfriend, Henry, has been a vegetarian most of his life. If a six-foot-one 20-something year old with an active lifestyle can function perfectly well on a vegetarian diet then there's no excuse for a 5'6" sedentary lump like myself to omit vegetables on the basis that 'it doesn't make me feel full or give me energy'. Lately, however, I find myself feeling sluggish no doubt thanks to endless takeaways on cold winter evenings. I've been craving a healthier, lighter diet; that Henry is vegetarian and I've been thinking a bit more about animal rights (I've given up foie gras) means that I've been toying with the idea of being pescetarian, eating more vegetables and far less meat. 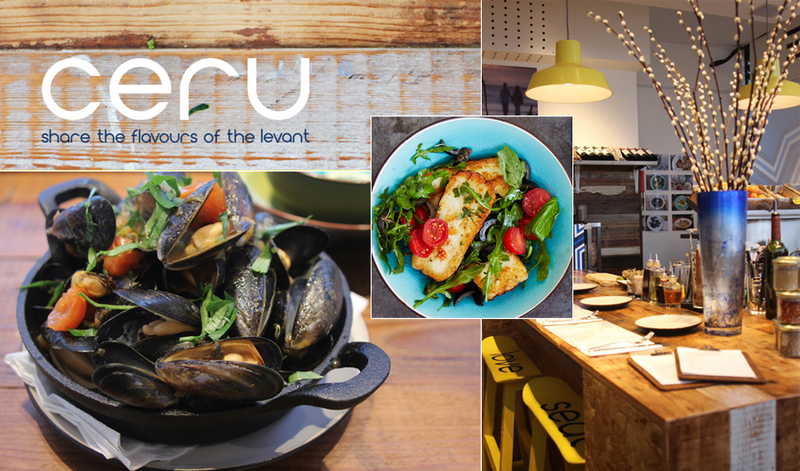 So when Ceru, a touring restaurant popped up (sorry, couldn't resist a pun) on my blog feed as a destination for healthy Levantine (Eastern Mediterranean and Middle Eastern) cuisine, the sun-soaked flavours of which I adore, I was immediately enamoured with the Eastern Promises (I'm on a roll with the puns today!) of light, healthy, and delicious food with many pescetarian, vegetarian, and vegan choices - perfect for me, as I suffer both guilt from eating too much meat and guilt that I might be 'excluding' Henry with my obscenely fleshy gastronomical choices. Henry and I bravely ventured out of Shoreditch and into the chaos of Central London. 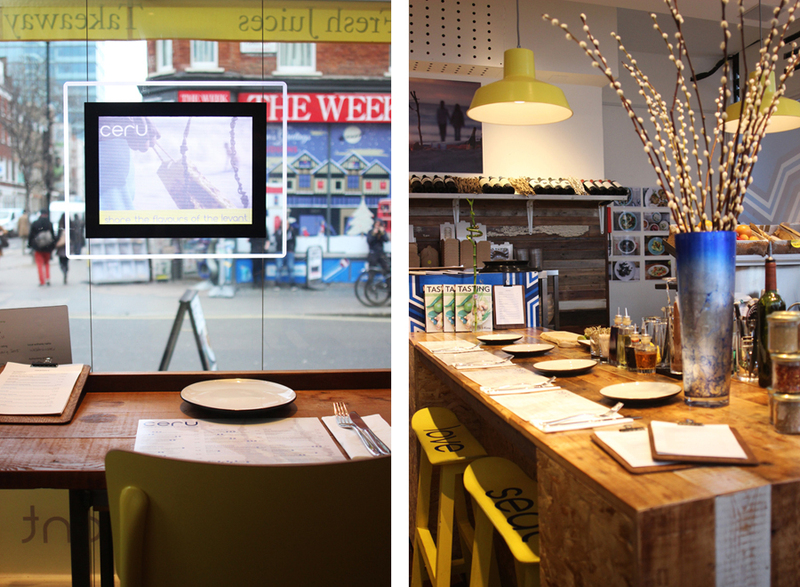 Tucked away from the cacophony of Oxford Street, in the relatively peaceful pocket of Fitzrovia, Ceru stood out immediately with its bright colours of blue and yellow - chosen to represent the Mediterranean sea and sun. Those colours, appearing as accents throughout the small restaurant, interspersed with woody decor, baskets of fruit, jars of spices, and bottled waters (rose, orange blossom) allowed us to daydream, if for a brief moment, that we were not in wintry London but rather a cozy cafe somewhere in the Med. We kickstarted our fantasy of being somewhere sunny with healthy, freshly squeezed juices. The selection changes every day, but ask for the ginger one if it's on the menu - it's just the zesty pick me up you need on a cold, miserable day. I was keen to venture into the tentative territory of going vegetarian, so Henry and I ordered three out of four dishes on the Veggie Heaven menu, some dips, and a shellfish dish to ease myself into the waters. The brilliant thing about the Ceru menu is that every non-meat dish is labelled for allergens and contents; gluten, vegan, vegetarian, dairy, nuts, eggs, even sesame seeds! It's very comforting to know that Ceru have gone to great care to inform their customers about what goes into the food, putting minds (and potential allergies) at ease. I myself don't have many dietary requirements but I imagine for those who do, a clearly labelled menu does make a whole world of difference. We started our sampling of the flavours of the Levant with a Greek bread basket and four dips; pancar (roast beetroot, yoghurt, garlic and pistachio nuts), fadi (fried baby courgette puree with tahini, roast garlic, yoghurt & lemon), hummus with green chilli and lemon, and my favourite dip: the spicy roast red pepper- the walnut and pomegranate molasses made for a texture and sweet flavour unlike anything I've had, and I've had a lot of dip! Henry loved the marinated and fried Haloumi with cherry tomatoes, black olives and oregano; something I'm keen to replicate at home to keep him (and vegetarian friends) happy. Curiously, this haloumi had an interestingly dense texture and felt satisfyingly thick, almost like meat. I had the blue shelled Shetland Island mussels all to myself. The coriander and tomato soup was delicious and I found myself scooping the dregs from the terracotta pot with the empty shells long after I'd finished the mussels. My only wish was that it was accompanied with thick bread that I could soak up all the soup with and eat! ...this, the aubergine dish! 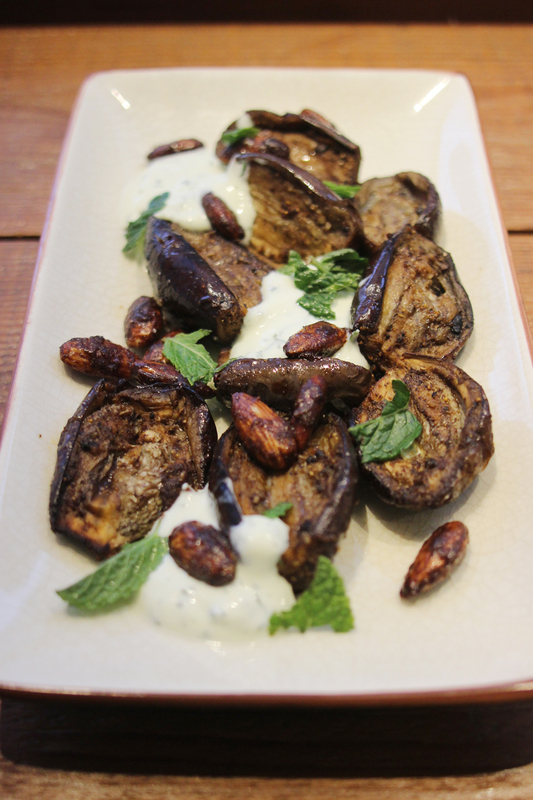 Roasted Chermoula aubergine with herb yogurt and spiced roast almonds. From the very first bite I was blown away by how perfectly nutty, rich, and sweet (but not overly so) the aubergine was, and how it was baked so well that every bite revealed that intoxicating aubergine smell! It's something I struggle to put in words, but aubergine lovers will know exactly what I mean. I expected the mussels to be my favourite, and I'm astounded to say that I enjoyed the humble aubergine even more than the shellfish! On the topic of fishing, you might be happy to know that Ceru are advocates of sustainable fishing (Executive Chef Tom Kime is a campaigner) and the environment. This passion and respect for the living world can be seen in the seasonal menu, using ingredients sourced ethically and locally in the UK as well as from across the Levantine region encompassing Cyprus, Turkey, Lebanon and Israel. Pleased that I was contributing somewhat to the sustainability of the environment while reducing my meat intake and trying something new, I allowed myself a treat in the form of dessert. I ordered the spice roast pears, which was tasty enough but was rather too heavy a pudding after such a filling meal. Yes, filling - I had not expected a mostly vegetarian lunch to fill me up as much as meat usually would, but there I was, struggling to get through a pudding! That was when I realised that I could easily get all the nutrition and energy I wanted on a vegetarian diet, and that I'd finally run out of excuses to not eat my greens. Back to dessert - the pears, spiced with cinnamon zest would've been better suited to an after-dinner pudding on an especially cold day, being as warm and thick as it was. Henry's ice-cream baklava, however, was exactly the sweet treat I needed! This was incredible - it had all of my favourite ice-cream toppings; brittle nut, pistachio, burnt caramel...no words. You have to order this when you're at Ceru, I don't care how full you feel. After the last of the plates were whisked away, I sipped on an invigorating yet calming fresh mint tea and contemplated the lessons learnt at Ceru that day - about how easy it was to live on a meat-free diet with a little imagination, about how surprisingly filling vegetables are, that I could easily power through a day with the right choices and perhaps slowly phasing meat out of my diet wasn't nearly as daunting - and certainly not boring! - as I thought it was. I went to Ceru expecting a 'light detox' sort of meal but left feeling no less full than if I would've eaten a regular meal yet I felt healthier for it, and slightly more educated, too! Ceru will be going on tour from 1 May 2015, appearing at a number of major UK festivals, but in the meantime you can find their pop up at 29 Rathbone Place. 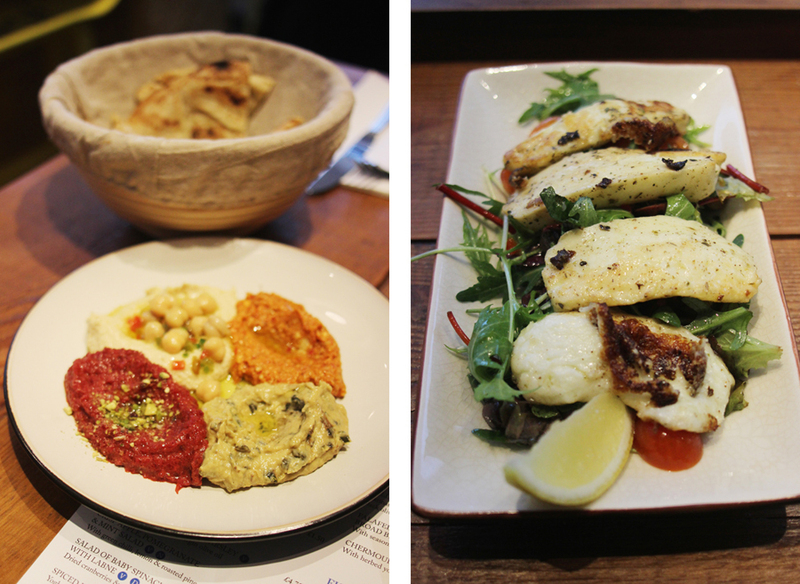 Thank you* for an afternoon of Levantine loveliness, Ceru, and for the healthy, delicious, vegetarian fare! *Henry and I were invited to review Ceru, but all opinions and words are, as always mine. Two photos in the first collage however are from the Ceru website, can you guess which? I'm glad that you liked it, I really enjoyed my lunch there too! I really need to go back and try those aubergines now! Looks absolutely lovely. I'm an avid meat eater too, but due to having lunch at the work canteen I do avoid it until the evenings - it's nice to fill up on veg and halloumi instead.